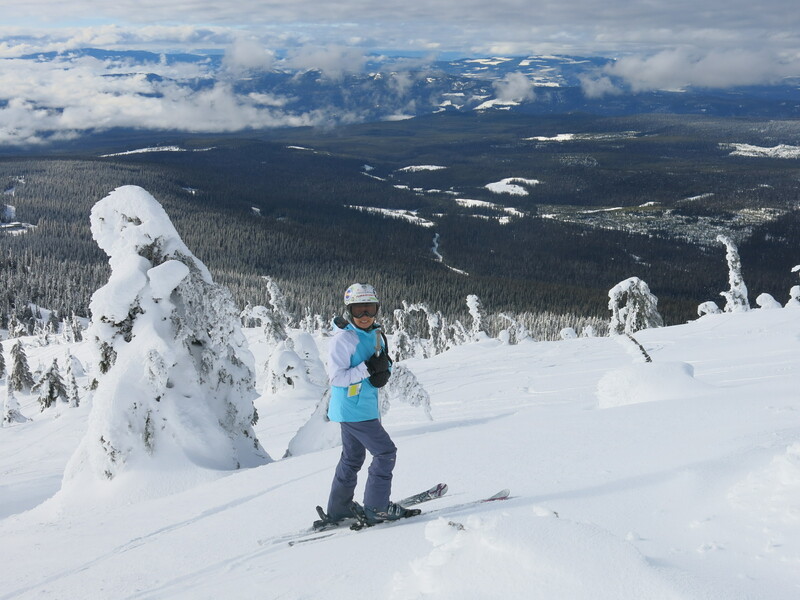 Big White is the 3rd largest resort in British Columbia and has a solid following of both Okanagan locals and destination skiers. 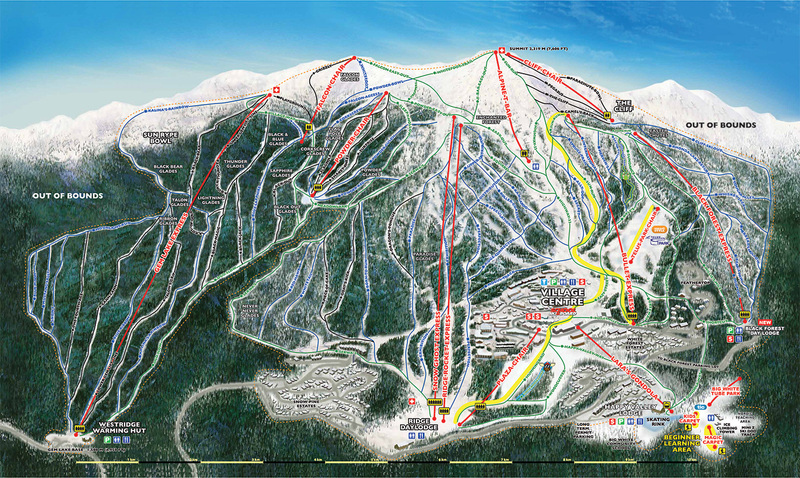 In addition to being the largest resort in the area, it also has the highest altitude and the most snowfall. 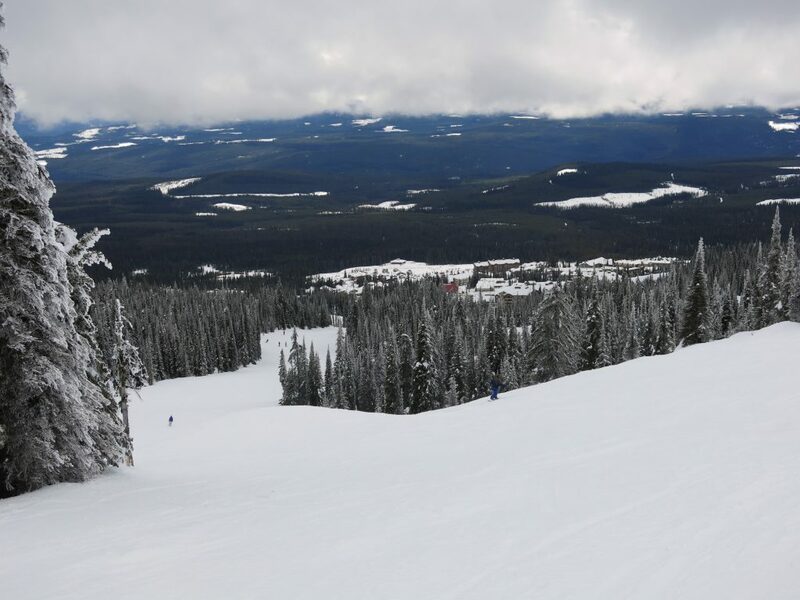 Big White was a little too big to really get a complete picture in one day of skiing under less than ideal conditions. 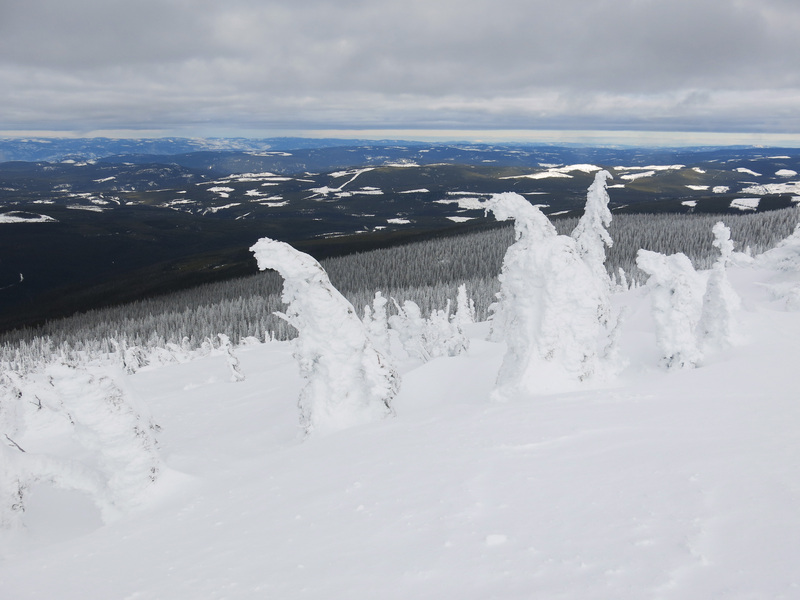 Also, we had skied Apex Mountain the day before and had really loved it, which colored our opinion of Big White a bit. There had been some rain below about 6,000 feet which strangely seemed to affect Big White more than Silver Star or Apex. We started at the base of the Gem Lake Express which is the lowest point of the resort. That one chair has almost 2,300 feet of vertical drop and we were really looking forward to spending a lot of time there, but due to the snow conditions it was really not skiable unless it was groomed, and only one of the runs was groomed and it was the easiest one. It looks like really interesting terrain though and on the right day and with more grooming it could be a great zone. In general we found grooming to be a little sparse at the resort and given the firm snow conditions that definitely impacted our opinion. The best skiing of the day was on the Falcon Chair, which is an ancient double chair above the top of Gem Lake. It’s not much vertical, but was above the rain-affected snow and there were a few of inches of fresh up there among the “Snow Ghosts” which are trees that are completely encrusted in rime ice from the frequent foggy conditions. It was pretty magical winding down the steeper terrain up there on the best snow that we found. 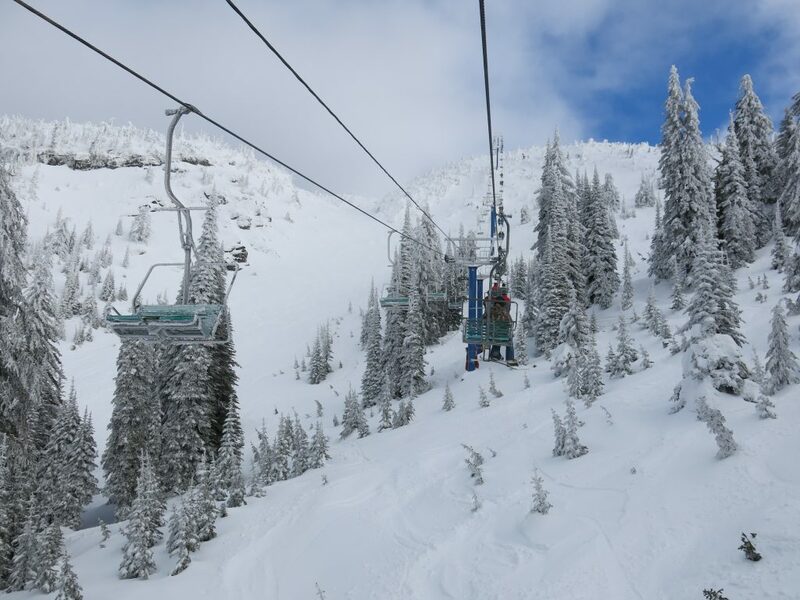 We spent most of our time on the Powder chair, which is a shorter triple and another one of the few fixed-grip chairs. Big White is full of high speed lifts, but the Powder Chair should probably have been upgraded before some of the other areas because that was some great terrain and it’s also high up on the mountain providing better snow conditions. Unfortunately it’s a bottleneck for people trying to get from the left side of the mountain back over to the right, so there was always a long line even though not many people were actually skiing the runs. After that, it got a little strange as we headed over to the parallel 4 and 6-pack high speed chairs Snow Ghost and Ridge Runner express. This creates the equivalent of a 10-pack high speed chair. With 10 people starting their runs every 6 seconds the runs were pretty crowded, but it is some great terrain that had a little more grooming than other areas of the mountain. 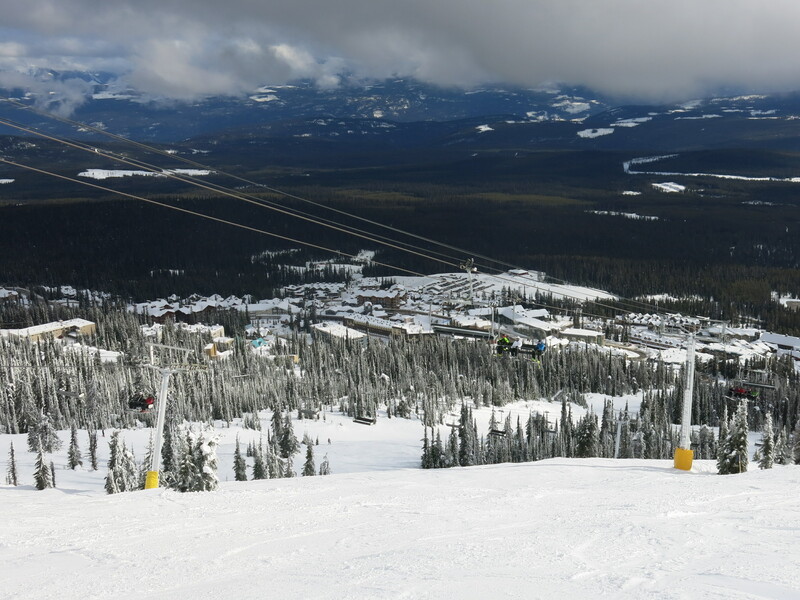 Big White has a great village area which more resembles a typical US mega-resort village with large hotels and plenty of restaurants. We had some great lunch food at the BullWheel Gastro Family Pub so couldn’t report anything about the resort-owned restaurants since we didn’t eat there. It’s always great to find convenient non-resort food options and this place has lots of them. After lunch we hit the Bullet Express and Black Forest Express. Bullet was not that interesting but there were some interesting winding blue groomers on Black Forest. That lift was very popular with a long line though. We would have liked to get to the very top but the T-bar was having mechanical issues, and by the time we got to the Cliff chair it was closed for the day. We kept forgetting that interior BC resorts actually close before 4PM and they start roping things off sometimes around 2:30. 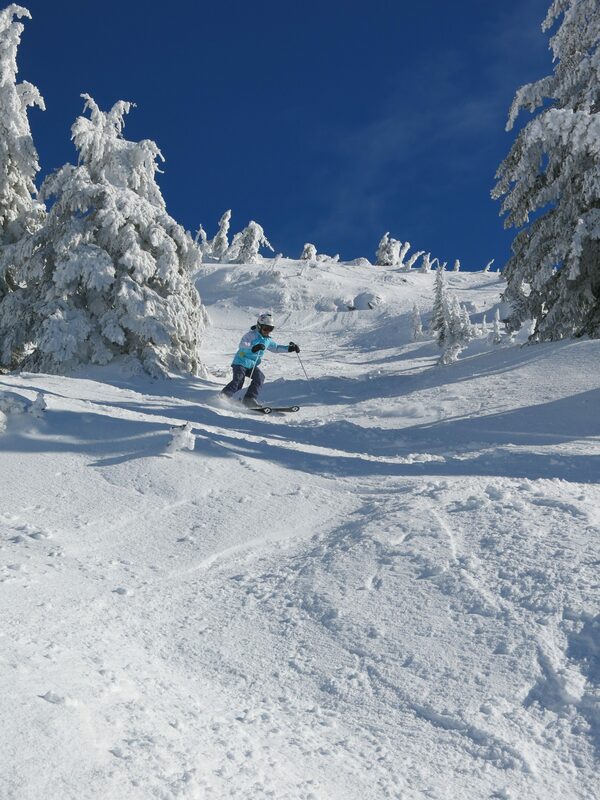 We weren’t really feeling it at Big White and definitely preferred Apex and Silver Star, but Big White has a lot going for it and should not be skipped if you are in the area.